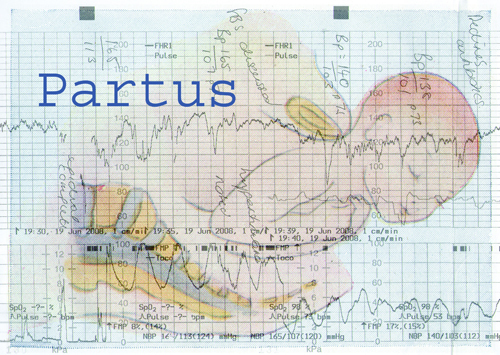 Partus (birth) is a collaboration between visual artist Ruth Jones and electronic composer Andy Wheddon that takes as a starting point a CTG scan of a medicalised labour and birth. The 10ft long paper trace contains ultrasound recordings of a number of bodily rhythms that faithfully record the labour, such as the mother’s contractions and blood pressure and the baby’s heart rate. Partus reinterprets and enacts the trace as sound, mediating between mourning the medical-technological intervention in labour and reclaiming the human experience. Partus will echo the altered experience of time that being in labour induces, linking the project to Jones’ on going exploration of liminal or threshold states. The performance will combine electronic samples and the live voices of improvisational singers Maggie Nicols and Emily Laurens, to take the audience on a journey through rhythmic primal beats to the extremes of human experience. Please complete the booking form below and then click “submit”. You will be taken to Paypal. where you can either pay with a Paypal account, or with a bank card.